I’m not entirely sure. Maybe an item finder with the same UI as the file finder but with a different shortcut? Maybe this item finder should only match items that are marked as a Heading 3 or above? This is something I’d wanted in Workflowy for years, but I’m excited because there’s finally a chance to fix it! To find everything, you can use shift+enter after using ctrl+F. You can use your arrow keys if you do not want to use your mouse. I’m sure there’s probably more to what you’re asking for, could you give an example of something else that you’d like to find on top of what’s already provided? I meant quickly navigating* to any item within the current file; I updated the title to make this more clear. * What do I mean by navigating? Either moving cursor to the item or zooming into it. Not sure which would be better. So something like say an extension of autocomplete, but the same UI, with results instead of suggestions, that are fully loaded, and can be navigated through by using your arrow keys (or mouse)? Autocomplete is for filling in stuff in the current line whereas I’m talking about moving to another line (my current line shouldn’t matter). I think the simplest explanation of the proposed feature is something like the File Finder (Cmd-O) but for items in the current file. The Ctrl+O finder now searches for both bookmarks and files, which is already a lot. Imagine you want to go to a file but three bookmarks also match your query. You now have press Down three times in order to open that file (or use your mouse). Use different shortcuts for different types. For example, Ctrl+O is for finding files, and there are a special shortcut for finding bookmarks and yet another for finding items. Pro: if you know what type you’re looking for, it’s going to be faster. Con: more shortcuts to remember; sometimes you don’t really remember which type you’re looking for. Mix all results together and use symbols to distinguish them. The ordering is only based on how much the name of the item/document/bookmark matches the query and nothing else. Pro: you only need to remember one shortcut for everything. Con: compared to alternative 1, you may need to type a more accurate query in order to bring up the right item; the mixed result layout may look messy. Also from the perspective of running a business, honestly if you can navigate to any item that easily, bookmarks kind of loses its meaning, and so is the 5 bookmarks limit in free accounts. As you probably know, there’s already a lot of things (maybe already too much) in Dynalist that’s free. Haha, I can’t believe that I didn’t think about that, but we’re on the same page. The Ctrl+O finder now searches for both bookmarks and files, which is already a lot. Use different shortcuts for different types. Is there a different shortcut for just bookmarks as opposed to Ctrl-O for files and bookmarks? I don’t see one in help. Mix all results together and use symbols to distinguish them. This sounds really cool! It’s Sublime Text-esque. That said, I’m not sure I can envision it being useful enough to justify the confusion that might come with it for unfamiliar users. I do understand! Glad I’m able to support you all! Not yet, I was talking about a possible alternative in order to accommodate items. That’s our concern as well. In addition, in Sublime Text there are symbols that developers already know: : for line number and @ for symbol. It’s hard to say which symbol we should use to represent a document or item or bookmark. But maybe we don’t need the prefix symbol at all… by “symbol” I meant the icon before each item. In the Ctrl+O menu right now, you can see bookmarks and documents have different icons. Items would have something different (a bullet point, maybe), this way you can know which are which when they get mixed up. Because there are just too many items, I think we’re going to discount their match score. Meaning your query will match bookmarks first, and then documents, and then items. I think we’re going to discount their match score. Meaning your query will match bookmarks first, and then documents, and then items. I’m still thinking about the two different shortcuts option because they represent different contexts: all across Dynalist and just in the current document. But… I don’t know. Some people (me somewhat) don’t even use multiple documents. I’d be curious what other people think. @JP1 @IbrahimQasim ? That’s an interesting point. Sorry I didn’t catch this point from your earlier replies. Personally I would find instantly jumping to an item in another document valuable as well. For now my workaround is to bookmark all the places I visit often enough. @Yatharth_Agarwal Here are my thoughts. I like this idea. Basically, having something that did Ctrl + F + Shift + Enter and worked like Ctrl + O (with the ability to search for bookmarks) would be super useful to me. In total we’d end up with three (main) shortcuts (ctrl O and ctrl f), with the third one being something like ctrl+shift+f/o, as Yatharth suggested. […] there’s already a lot of things (maybe already too much) in Dynalist that’s free. And it could be restricted (don’t know about how on a technical users) to users on pro plans. It would be like Everything by Voidtools for Windows. Super fast and comprehensive. From there, we can use filters like is:document (would exclude the first line or title of each document from results) is:bookmark, is:completed (not implemented yet), etc. I think that maybe both ctrl+shift+f/o should work for the comprehensive search feature, since it a mix of the two. How to jump to item while maintaining context? On some more reflection, the conclusion I’ve come to is that a Cmd-O like shortcut that worked with headings as well would be awesome. 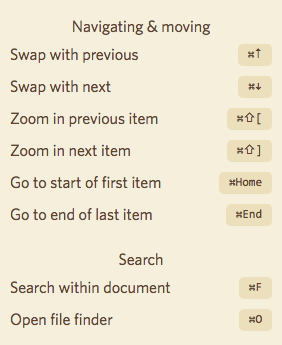 This also neatly solves the document/item divide, sidestepping ‘superman mode’ and all that with a simple modification. Those so inclined could keep everything in a single/fewer documents, yet still be able to jump between different contexts easily. @Erica @JP1 What do you think? I think if the same shortcut indexed headings, then that would be enough and influence people’s behavior in a positive way, resulting in more organized the fewer documents (as you’ve pointed out). And if granular sharing options for bullet points come out, then a change in UI could make documents mostly moot. (Since I’m not affiliated with Dynalist, this is solely my opinion:) The only concern here would be making Dynalist too free as it could make bookmarks useless, since the switcher is faster (although it doesn’t index everything). So to meet both needs (as Dynalist needs to be worth the time and effort to build and maintain, even if it’s sustainable), I guess indexing or a separate section just for searching super powers (I guess sort of like slack) could be pro-exclusive. Let me know if you think this would be fair or if you have a better idea. A different shortcut/search is definitely not convenient! Universal Go To is one of the highlights of good text editors / IDEs. Making headings ‘go to’able only for Pro users sounds reasonable, though. Think of it is as settings for the existing search engines. I hope that makes sense. "Open File" vs "Find Item"